We're three weeks into the new year. How are those 2014 goals, resolutions and habits working out for you? Oh you don't believe in resolutions, so you didn't make any? Ok, I'll buy that. But...you know as well as I do that when we got near that New Year that little voice started in on how you were going to do this better and try that new thing and lose weight and work out more and eat healthier and do yoga everyday and not spend so much time on Facebook and…Yeah, I get it. I didn't make them either. I did come up with my word of the year though. I thought hard about what kind of year I want to experience. How do I want to feel, who do I want to be, who do I want to connect with? It took work but I was able to distill my thoughts down to the word of the year that will keep me focused, active and on purpose. Give. That is my priority. Give with all its implications, beauty and uncertainties. Because to give wholeheartedly means being vulnerable, putting myself out there, reaching and connecting with you and with others. It means opening, baring and sharing. Not knowing if what I have to give will be appreciated, well received or even noticed. But I can't worry about that. Because those are the fears that have stopped me before. Those are the fears that keep me safe but empty, lonely, paralyzed, wishing, hoping and planning instead of doing, being and giving. In this instance, safety is overrated. and I'm sure sometimes even unannounced, unsolicited, unedited, and even unheeded. I won't be naive about it. This isn't a blind, Kumbaya, Pollyana, isn't-life-grand stance I'm taking. Obviously I get something from this too. Because I can't give fully without replenishing, refueling and immersing myself in what I need, love and inspires me. So you caught me. 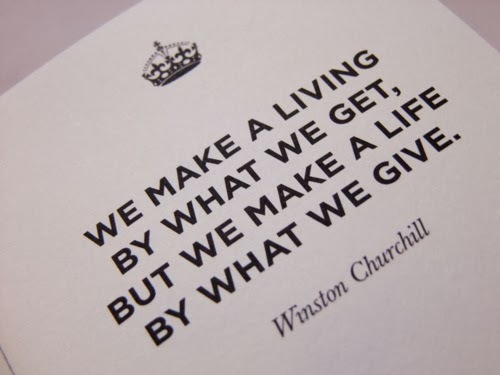 In giving I'm also receiving. Thing of beauty. But you can't give solely to “receive” because there is no telling what you will receive. No way to plan that. That's the adventurous part of it all isn't it? Opening yourself up to unimaginable possibilities. I get butterflies in my stomach just thinking about it. Ok, 2014. Bring it cause I'm gonna give it.